Parents everywhere know that teething can be one of the most daunting parts of raising an infant. Not only does it make them irritable, but it also adds dental health to the big list of things you’ll need to look after! A baby’s first 20 teeth are already present in the jaws at birth and begin to sprout when a baby is between the ages of six months and one year. Yes, parents need to start thinking about dental health from a very early stage! Your child’s teeth affect chewing and speech – that’s why it’s best to take your child to their first dental appointment no later than their first birthday. But healthy dental habits don’t start there. No, they begin long before your baby’s first checkup – make sure to prepare ahead of time with these helpful tips from Dental Care Group – your local dentist in Armadale, welcoming patients of all ages. Bath time is a great time to brush your baby’s teeth. It’s best to begin cleaning your baby’s mouth even before his teeth have erupted, by wiping his gums with a clean washcloth daily. Establishing a habit of dental hygiene early on is a must. 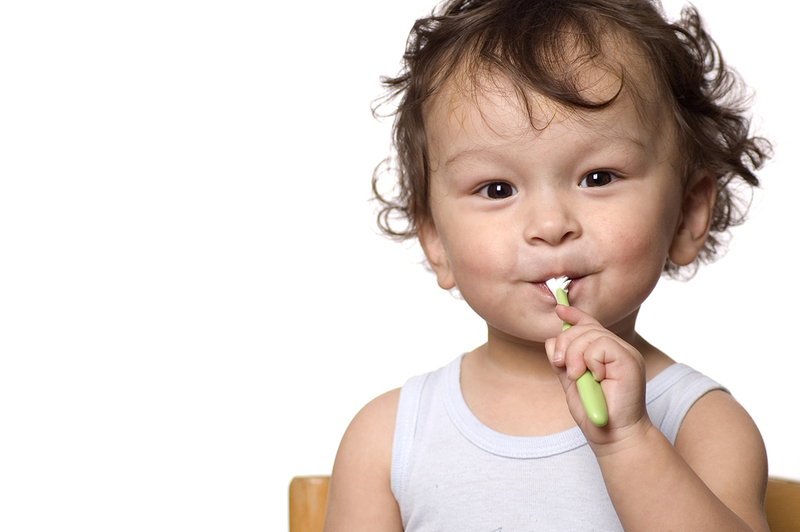 Once baby’s teeth start erupting, you’ll need to start brushing. For children under three, you’ll need to be gentle. We recommend brushing with a small brush with soft, gentle bristles twice a day. Since their teeth are small, you’ll only need a rice grain sized amount of fluoride toothpaste to get the job done. For children ages 3 to 6 years old, up the volume of toothpaste to a pea-sized amount. Make sure that your child avoids swallowing any toothpaste. While fluoride isn’t poisonous (and actually strengthens teeth), it should not be swallowed. 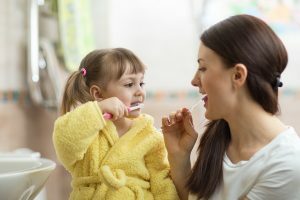 Habitually cleaning your baby’s teeth and gums don’t just ensure a healthy smile – it also establishes good oral health habits that they’ll practice for the rest of their lives! Teething makes your child irritable and uncomfortable. This calls for solutions that help your child find relief when their first set of teeth emerge. Teething makes most children bite and chew on things for comfort – it’s not something you can stop them from doing. As such, Dr Zelman Lew of Dental Care Group recommends that infants are given a chilled teething ring to soothe sore gums. Be cautious in giving your child over-the-counter gels and painkillers to ease teething pain. Some medications contain Benzocaine, which is believed to cause a blood disorder called methemoglobinemia. If your child is struggling through immense teething pain, we recommend dropping into our dentist in Armadale. Our experienced team will be able to diagnose any complications in teething and prescribe safe treatments for them. Make baby’s first visit to the dentist exciting, not scary! At Dental Care Group, we’ve heard all the “evil dentist” jokes. Baby’s first trip to the dentist can be scary. Not only that, but if it sets the wrong tone, it’s possible your child will avoid seeing the dentist well into adulthood – if you ask us, nobody wins in that scenario! It might even be worth bringing baby along to your own appointments (even before their first) so they can get used to the sights and sounds of the clinic. As parents, you’ll want baby’s first check-up to go as smoothly as possible. You’ll want a visit that boosts baby’s confidence around their dentist and makes the idea of going to a dental clinic fun and exciting. One thing you can do is choose a dental practice that takes great care to provide a friendly atmosphere. Our team take great care to ease dental phobias by creating a light-hearted, friendly, familial atmosphere. You can help too! Get into the habit of explaining to your child who dentists are and why they need to visit them. Help your child understand that their dentist appointment can be a fun adventure they should look forward to! It’s their first time, after all – any first-time experience can cause babies to feel uneasy or unsure. Expect your child to show signs of fussiness as a way to cope with what they’re feeling. Be kind and gentle with your child and offer them comfort at all times. Don’t show any signs of worry or stress – kids are smarter than we give them credit for, and they will pick up on those subtle signals. If you have dental anxiety of your own, that means doing your best to suppress it. If you can’t, bring another adult with you to soothe your child’s discomfort. Not only can they provide a calming presence for you and the child, but they can keep your baby occupied as you chat to your dentist for questions and advice. Good oral care starts early! Dental Care Group is a family dentist in Armadale, welcoming patients of all ages: we provide dental services to all members of the family, including the newest additions. We help by treating problems, educating, and instilling good habits. This ensures your child’s healthy smile carries through to adolescence and eventually, adulthood. Our gentle and caring approach calms your nervous little ones, making them feel at ease from the moment they first enter the clinic. Contact Dental Care Group now on (03) 9509 1500, or book online to schedule your baby’s first appointment with our dentist in Armadale.